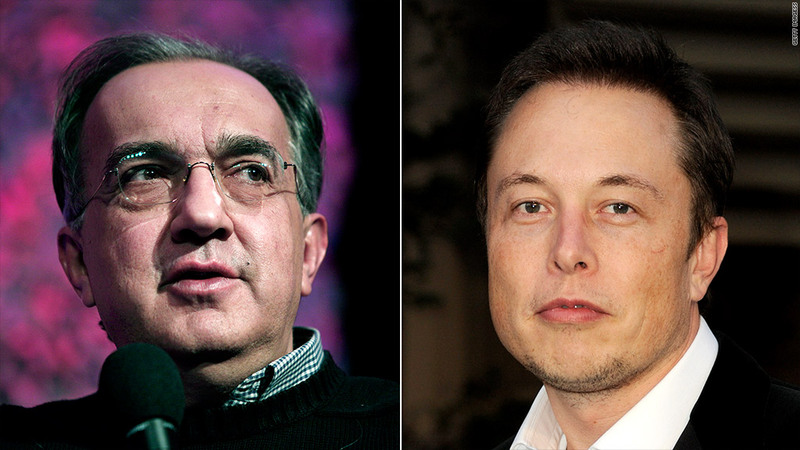 Sergio Marchionne, left, the CEO of Chrysler Group and Fiat, isn't happy by the claim of Tesla CEO Elon Musk that Tesla is the first automaker to repay all of its loans. Chrysler Group and Tesla Motors, run by two of the most outspoken CEOs in the auto industry, are trading zingers over the help each company received from the federal government. On Wednesday, Tesla (TSLA) paid back its $465 million low-interest U.S. Department of Energy loan almost 10 years ahead of schedule. And in announcing the news, the automaker took a shot at Chrysler and General Motors (GM), which both received federal bailouts in 2009 as part of their bankruptcy reorganizations. Go inside the Tesla Model S.
"Following this payment, Tesla will be the only American car company to have fully repaid the government," said Elon Musk, the chief executive of Tesla. Chrysler, headed by legendary Fiat chief Sergio Marchionne, wasn't too happy with that statement. It quickly issued one of its own, pointing out that Chrysler had in fact paid its loan -- early. "The information is unmistakably incorrect. It's pretty well-known that ... Chrysler Group LLC repaid (in full and with interest) U.S. and Canadian government loans more than six years ahead of schedule." Chrysler went on to take a veiled shot at the electric vehicles, ending the statement with -- "Question: short memory or short-circuit?" But Chrysler's statement told only part of the story. It's true that Chrysler repaid a $5.9 billion government loan it got as part of a larger U.S. bailout of the company. Chrysler had a good reason to pay it back: The company was paying 7% to 14% interest on the loan. Marchionne once complained of "shyster" interest rates, a comment he later apologized for. But Chrysler did not repay all of the rest of the $12.4 billion bailout it received. Instead, Treasury received stock in Chrysler. And when Treasury finally sold those shares back to Chrysler in 2011, it did so at a loss of about $1.3 billion. The government is also likely to lose money on its bailout of General Motors when it is done selling its shares, although like Chrysler it has repaid the loan portion of its bailout. Asked for comment on Chrysler's statement, Musk tweeted Thursday that he had specified it was the first U.S. car company to repay the government, and that Chrysler is a unit of Italian automaker Fiat. But Musk's response is wrong. Fiat and Chrysler are still separate corporations and when it repaid the loan Fiat was not even the majority owner of Chrysler. And GM has always been a U.S. automaker. He did not make the more effective argument that the loan repayment did not in fact repay taxpayers the whole cost of those bailouts. "reprehensible" for trying to have him removed from leadership of a European auto industry trade group. Musk has taken on his own share of auto industry sacred cows. Foremost, Tesla is the only publicly-traded automaker building only electric cars. He's also challenged the industry's powerful dealership structure, selling his cars through company-owned stores. But Musk has won fans in the sector, including analysts who keep raising target prices for Tesla's stock and influential Consumer Reports, which said the Model S is the best car it's ever tested. For the record, the Energy Department loan to Tesla was unrelated to the bailouts of GM and Chrysler. It was a program created during the Bush administration before the financial crisis that pushed the auto industry to the brink of collapse. 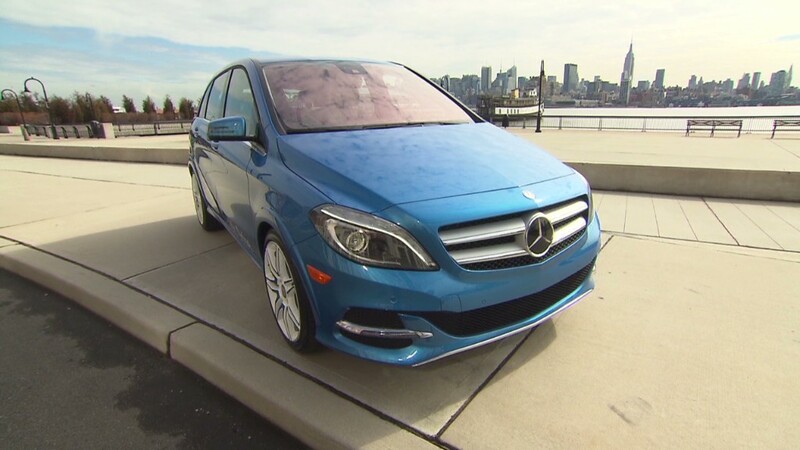 It is designed to encourage the development of green energy, such as alternative fuel cars and solar power. Tesla paid between 1% to 3% interest on the funds it received. The Energy program has suffered more high-profile failures than successes, including the bankruptcy of solar panel maker Solyndra, which borrowed $527 million from the program. Another upstart electric automaker, Fisker, received $192 million. But Fisker has essentially halted all operations and missed its first scheduled payment and is likely to default on the loan.